Lottie Jacks does not like to leave a project unfinished, even if it means resuming work on it after a 65-year hiatus. “I wanted to finish what I started,” said Jacks, explaining why she re-entered Samford University in the summer of 2015 to complete a degree she began in 1948. 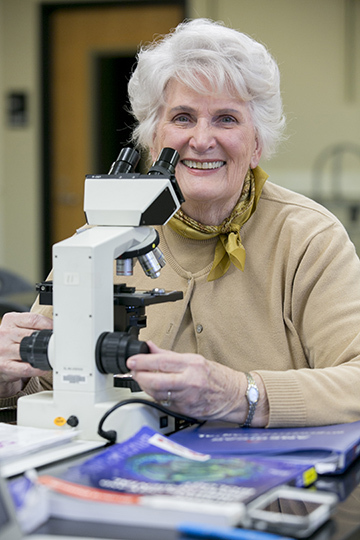 Jacks, who turned 85 in December, is on track to receive her bachelor’s degree on May 14 after taking her final 10 credits this spring semester. Jacks had enrolled in Howard College as a biology major on a full-tuition scholarship provided by First Baptist Church of Birmingham. Love won out, however, and she dropped out one semester shy of a 1951 graduation to marry her longtime sweetheart, William Russell Jacks. They were married for 59 years before he died in 2010. In spring of 2015, Jacks, who lives in Vestavia Hills, decided it was time to pursue that dream. Pleased to find her transcript still on file, “all neat and tidy,” in June, she enrolled in her first college course in six decades. The thought of her first exam, in the history of language, almost did her in, recalled the mother of four, grandmother of seven and great-grandmother of two. “I texted Dr. Rosemary Fisk [her adviser] that I just could not do it,” she said. An immediate call from her professor, English department chair Brad Busbee, however, kept her on track. A project she undertook for an independent research course in the fall has fascinated Jacks as well as her professor and others. The study of the feeding habits of turkey vultures meant setting out carrion (decaying animal flesh) in a field to attract the scavengers that are known for eating almost anything. With the help of a daughter and son-in-law, Nancy and Buck Brock, Jacks set up cameras to record the vultures’ preference for fish, fowl or fruit. “It’s very exciting,” she said of the research. “I have really learned a lot. “Vultures have a special property in their bodies that takes care of terrible bacteria,” said Jacks, who worked for 35 years as a medical technologist at a clinic and for a physician’s practice. Her professor for the course, Betsy Dobbins, applauds Jacks’ enthusiasm. This spring, in a senior seminar course, Jacks is revising and expanding the research paper with references and other editing to make it her senior thesis. She is also taking a senior-level embryology course and music appreciation to complete the 32 credits she needed to graduate. Being back in the classroom after so long away has been challenging but rewarding, she said. She also still teaches a longstanding Bible study class at Brookdale senior living community in Homewood. She maintains her longtime involvement in Samford’s Legacy League, which she has served as president and as a tireless raiser of funds for scholarships. In 2015, she received the group’s Lolla Wurtele Wright Award recognizing special dedication and devotion to the league. With days to go before graduation ceremonies on May 14, Jacks looks forward to completing what she began all those years ago.